As we near the end of another great year, I wish to thank all the volunteers and supporters who helped to make the Indian River neighborhood a better place this year. Your support is essential to achieving the Friends of Indian River goals to improve the quality of life for all the residents of the Indian River neighborhoods. We ask that you continue to keep up this good work by participating in our volunteer efforts, joining us for our monthly guest presentations, becoming a supporting member, and spreading the word. - 5 cleanups collecting 81+ bags along Indian River Road, along the riverfront, and in Indian River Park. These cleanups were under the auspicious of the Adopt-A-Road program, the Great American Cleanup, Clean the Bay Day, and the International Coastal Cleanup. - volunteers contributed more than 450 hours of time and effort to make our neighborhood better. https://www.facebook.com/FriendsofIndianRiver/photos_stream (you don't need a Facebook account to see the photos). 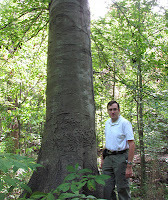 - organize a bioblitz to survey the flora and fauna of the park. Also in the coming year, the Elizabeth River Project (ERP) - and its River Star Home Program - is planning a significant expansion of its efforts along the Eastern Branch of the Elizabeth including the Indian River. The Friends of Indian River have already started discussions with the ERP and intend to be a key stakeholder in those efforts as they develop. Our next meeting is on Thursday, January 9th, 7 pm at the Oaklette United Methodist Church. This is our official annual meeting and we'll hold elections and have a forum to discuss these plans and get ideas for 2014. If you have a particular concern or interest,such as projects for schools, scouts, gardening, the shopping center, please come and tell us of your interest. Everyone is invited to the meeting; supporting members who have paid their membership dues may vote. 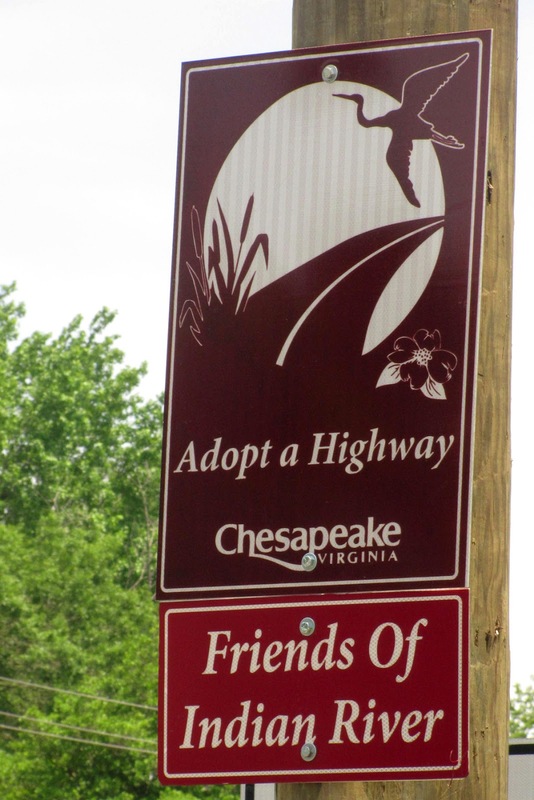 On Saturday, January 11, 9:30 am, we're having our first Adopt-A-Road cleanup along Indian River Road. Please join us and, again, thank you for your support. At our December Holiday Party, we recognized our many volunteers who performed around 500 hours of volunteer service around our community. And this undercounts the hours of effort put in by our volunteer board of directors in organizing various activities! 10+ hours of service: Diane B., Helene H., Jim H., Barbara M., Amy W., Kenny W., and Chris W.
30+ hours of service: Ed B., Linda B., Sharon K., Carol W., and Jayne W.
and for those with Perfect Meeting Attendance. Once again, thank you to all our volunteers! We hope everyone had a wonderful Thanksgiving. This Saturday, December 7th, please join the Friends of Indian River for a volunteer event to remove Invasive Ivy Indian River Park from 9:00 AM to Noon. We'll mainly be cutting English Ivy that has grown up trees. This will prevent the ivy from creating fruit and creating new outbreaks in the park. Please wear closed-toe shoes, a hat and bring work gloves; we recommend long pants and long sleeved shirts. Bring pruning clippers, loppers, screwdrivers (which are amazingly useful in prying ivy off tree trunks) and/or pruning saws if you have them. We'll have water and a snacks available. Participants under 18 years of age must have adult supervision. Meet at the park entrance at Rokeby Ave. and Main St. (2001 Rokeby Ave.) which is located just south of Military Highway, i.e. across Military Highway from the Fire Station. Next Thurday, December 12th, we are having our Holiday Party at 7 PM in at the Oaklette United Methodist Church, 520 Oaklette Drive. This will be our end of year celebration to recognize our many accomplishments, recognize our volunteers, and socialize. Please bring a desert to share and join the festivities. We'll have a silent auction, so you can finish some Christmas shopping too. Please also consider bringing a donation of non-perishable food items for the Oaklette United Methodist Church food pantry to the meeting this evening. Even if you have not been to a meeting in a while or if this would be your very first meeting, we encourage you to come out and partake in the merriment. Thank you to the eleven volunteers who came out this morning to clean up along Indian River Road and under Indian River Bridge. All in all, the volume of trash was lower than in past cleanups, which is an encouraging trend. Still we collected 6 big bags of trash from under the bridge and another 9 bags along the roadway from MacDonald to Wingfield. The team was proud of their accomplishment: all litter we collected is litter that no longer despoils our streets or is washed into our waterways. By far, the item we collected in the greatest quantity were hundreds and hundreds, perhaps thousands, of cigarette butts. If you know a smoker, please remind them that cigarette butts are made with plastic fibers, are not biodegradable, and should never be tossed out their car window. We had a great turnout for our inaugural hike on the new nature trail in Indian River Park. A big thank you to all the groups who made this possible including City of Chesapeake's Department of Parks and Recreation, the Urban Forest Trail Blazers, the Chesapeake Master Gardeners, the Virginia Cooperative Extension – Hampton Roads Master Gardeners, the Chesapeake Arboretum and the Eastern Virginia Mountain Bike Association, and all the great volunteers of the Friends of Indian River. 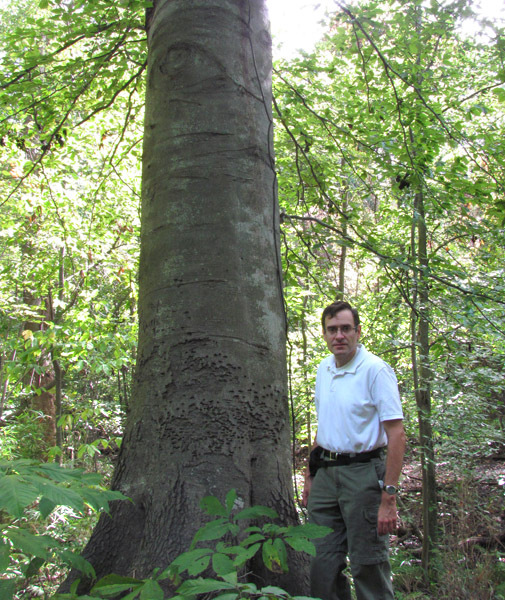 On December 7th, we'll be back in the park to work on the removal of invasive English ivy. Come on out and lend a hand. For our full listing of upcoming events see our calendar. The Friends of Indian River and the Urban Forest Trail Blazers were out in force today to install signage along the new nature trail in Indian River Park. With beautiful weather and great enthusiasm, the team installed 25 tree identification signs and 6 directional posts along the trail. The trail is now open for exploration and we've scheduled a guided hike on Saturday, November 9th at 10 am. We hope you can join us. The Parks and Recreation Department and our volunteers were out in force on Wednesday and completed mulching the 300 yard central section of the nature trail in Indian River Park. The Parks Department used "gators" to haul load after load of mulch into the park and our hard working volunteers, and Lennie Luke - Senior Planner from the Parks Department - unloaded and spread the mulch along the trail. It was a hard six hours of work, but the job was completed. Thank you to volunteers for Nature Trail Work! We extend a big thank you to the volunteers from the Chesapeake Trailblazers and the Friends of Indian River who came out in the rain today to work on the new nature trail in Indian River Park. The team completed the planned work to widen the trail. The next step is on Wednesday when the City will come out to help spread mulch on the center section of the trail. (no Facebook account required to view photos). We've got a busy and hopefully fun filled calendar for the Friends of Indian River over the next couple of months. On Thursday, October 10th, 7 PM, we'll have our Monthly Meeting at Oaklette United Methodist Church. Rachel Burns from Buy Fresh, Buy Local will speak to us about their program and the benefits buying looking produced goods and services. We'll also have an update about our own local Indian River Shopping Center. As usual we'll have some light refreshments after the meeting. At the meeting we'll also be taking advance orders for Friends of Indian River T-shirts. We'll be ordering direct from the manufacturer and the estimated price is $16 for white T-shirts and $23 for colored T-shirts; the exact price will depend on how many we order. 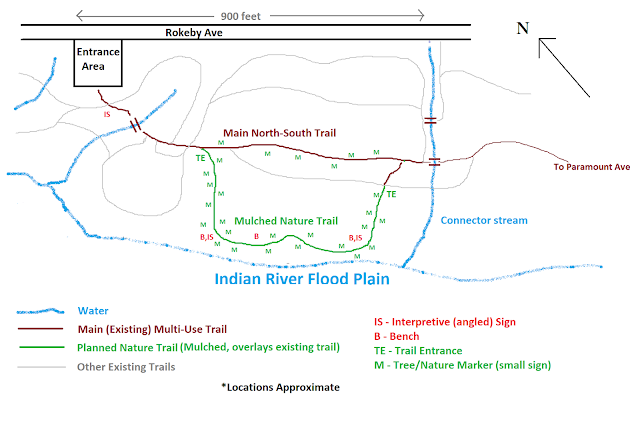 On Saturday, October 12th, at 9 am, we'll start work on the new Nature Trail in Indian River Park. The trail will mostly follow an existing trail in the park but we'll be doing some widening, re-routing, and removal of invasive plants. The Trailblazers will provide a pruning demonstration and instructions before we start. Bring pruning clippers and pruning saws if you have them. Please wear closed-toe shoes, a hat and bring work gloves and other items that may be useful. We recommend long pants and long sleeved shirts. We'll have water and a snacks available. Participants under 18 years of age must have adult supervision. Please RSVP to info@friendsofindianriver.org. On Wednesday, October 16th, the Parks Department will have a crew in the park to help spread mulch on part of the nature trail; we need some volunteers to help rake the mulch. Then depending on what we get done during the week, we may have another work effort on Saturday, October 19th. If you can help out on either of these days, let us know at info@friendsofindianriver.org. Also on Saturday, October 19th, the City will have a Recycle Day event at Woodland Heights Baptist Church at 529 Providence Road. Residents can drop off Electronics, Plastic Bags, Clothing and Household Items, Household Hazardous Waste, and everyday Recyclables. The Friends of Indian River will also be supporting this event and we need volunteers here too. If interested, please contact info@friendsofindianriver.org. On Saturday, October 26th, we'll be finishing up the work on the Nature Trail in Indian River Park. We'll be installing signs along the trail. Please wear closed-toe shoes, a hat and bring work gloves and other items that may be useful. We recommend long pants and long sleeved shirts. We'll have water and a snacks available. Participants under 18 years of age must have adult supervision. Please RSVP to info@friendsofindianriver.org. In November we'll have a fun inaugural hike at the park on Saturday, November 9th, our regular meeting on Thursday, November 14th with presentation about Plastics, and an Adopt-A-Road Cleanup on Indian River Road on Saturday, November 16th. The Indian River Bridge crosses the main tidal reach of the Indian River and is the main connection between the Oaklette, South Fairview and Plymouth Park neighborhoods with the Norfolk Highlands and Tanglewood neighborhoods. The sidewalks along the bridge are used by pedestrians to walk, bike, or jog from one neighborhood to the other and to area services such as the post office, churches, laundry mat, eateries, food stores, restaurants. The open space areas around the bridge can act as an important riparian buffer along the waterways. 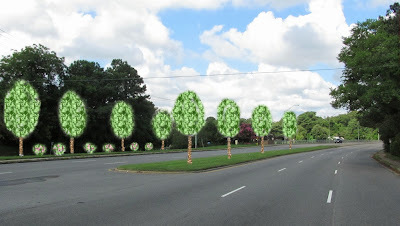 On the southeast side of the bridge, there is a large public/open space between Indian River Road and Oleander Avenue. This area along the roadway has the potential to provide a useful riparian buffer - a vegetative filter - to the Indian River. The area around the Indian River Bridge was adopted by the Friends of Indian River in 2012 and we've been practicing good stewardship of the four planters at the corners of the Bridge. Working through the Adopt-A-Garden program we've performed regular volunteer clean-up efforts, conducted much needed pruning and care to existing crepe myrtle trees, and prepared and maintaining garden beds and plantings around the Bridge. 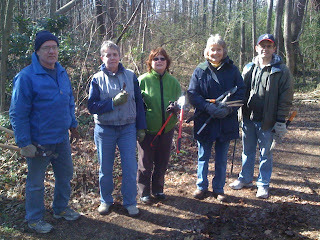 We had great weather and an energetic, if somewhat small, turnout for our cleanup along Indian River Road today. Nine volunteers worked their way up and down Indian River Road. Of those, five worked on the approaches to Indian River Bridge and the shoreline under the bridge as part of the International Coastal Cleanup. All in all we collected twenty bags of trash - cigarette butts, food containers, beverage cans and bottles, grocery plastic bags, fishing lines, a variety of clothing items, and a bicycle tire. All trash which is no longer messing up our community or polluting our river. While its unfortunate to report that we collected twenty bags of trash, it is a significant improvement over our initial cleanups along the road and river last year, when we netted twenty bags and forty bags of trash at two separate cleanups. Our total today is two-thirds less and we're getting done in half the time. We extend a big thank you to all our volunteers who came out today. We also hope more of you receiving this can make it out for our next cleanup on November 16th. Remember, many hands make light work. Please join us for Clean the Bay Day on Saturday June 1st to help clean up our river and our bay. We'll meet by the playground at Rokeby Ave and Providence Road at 9am and working until around noon. This year is the 25th Anniversary of Clean the Bay Day. During this time 122,000 volunteers, who have removed approximately 5.8 million pounds of debris from nearly 5,500 miles of shoreline in Virginia alone. Last year, the Friends of Indian River collected about a 1000 pounds - 40 bags full - of trash from our shores. Be part of this grand effort. The Friends of Indian River's will be doing our cleanup along the stream buffer in Indian River Park, the headwaters of the Indian River. This will help to spruce up the area, collect trash that will otherwise get washed into the river and impact wildlife. The city will provide garbage bags. We'll have water and snacks available. Please wear closed-toe shoes, a hat and bring work gloves and other items that may be useful. Participants under 18 years of age must have adult supervision. We are planning to have a picnic after the cleanup. The Friends of Indian River will bring hot dogs, burgers, and drinks. We invite folks to bring a side dish like dessert, chips, pasta salad to share. To help our planning, please reply back to this e-mail if you know you will join us. (Last minute volunteers are still always welcome). Our planting efforts were delayed yesterday morning by the persistent drizzle, but around 11 am we pulled out the shovels and got to work on the corners around Indian River Bridge. By the time we were done we set up the gardens at the two bridge corners on the westbound side of the bridge and added some plants on the eastbound side. Altogether we planted 10 rose bushes, 6 azaleas, 4 muhly grasses, and 5 verbana. Still to come later in the season will be black-eyed susans. A big thank you to our volunteers for coming out to help beautify the neighborhood! Last Fall's Gardens are doing Great! A half dozen dedicated volunteers had wonderful weather to work on the planters at the corner so Indian River Bridge today. We removed bags and bags of weeds from all four planters, including Japanese Honeysuckle, English Ivy, Phragmites, and one small Chinese Privet tree. The team also spruced up the two gardens we planted in the fall on the eastbound side of the bridge. This was all in preparation for our next outing on May 4th when we'll plant two more gardens on the westbound side of the bridge. Our plans include Muhly Grasses, Knock-out Roses, and Azaleas. We hope you can grab your gardening gloves and come out and join us on that Saturday. Other upcoming events on our calendar include May 9th when Vickie Green will speak to our group about River Friendly Gardening at our monthly meeting and June 1st when we will participate in Clean the Bay Day by cleaning up around the streamside in the park at Rokeby and Providence.